I couldn’t resist creating a new candle mat using some of my favorite summer flower colors, pink, purple, and yellow. Those colors make me think of the pink and purple petunias my mother used to plant in the summer flower beds. I gravitate towards picking those flower colors, also. You could easily create this candle mat using your favorite flower colors, too. It would be fun to make a pair of these to use as mug rugs to use while sharing a cup of tea or coffee with a friend. 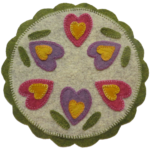 Previous post: Announcing Blooming Hearts Candle Mat!